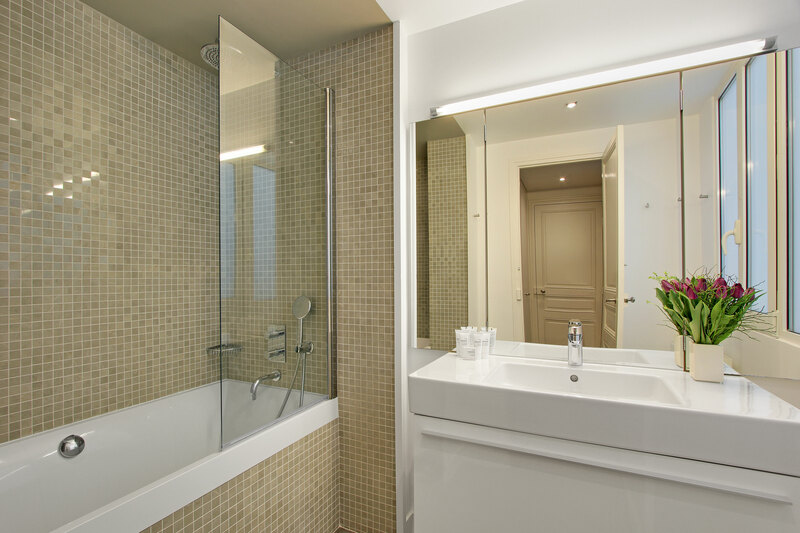 On the 4th floor of a classic Parisian building with elevator this 95 square metre (1,020 sq ft) apartment has all the rooms off a main corridor so that each room is independent. 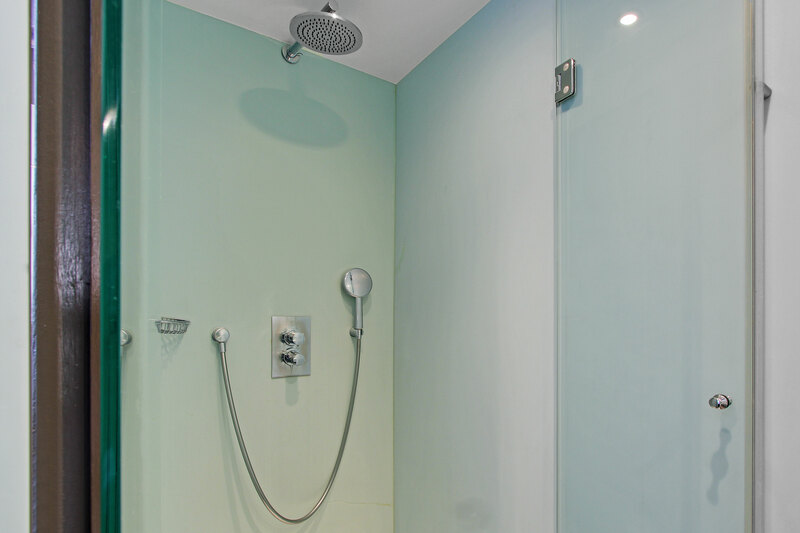 The 1st bathroom has a bath with shower and the second bathroom has a shower. 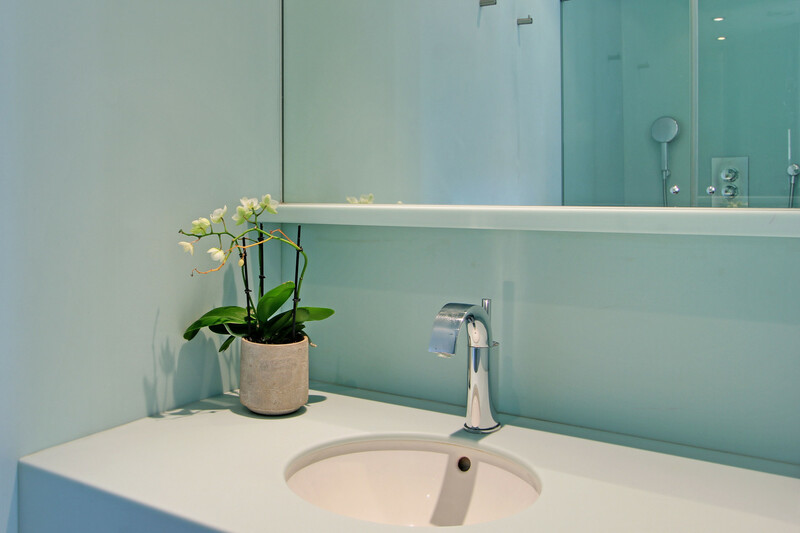 The water closet is separate. 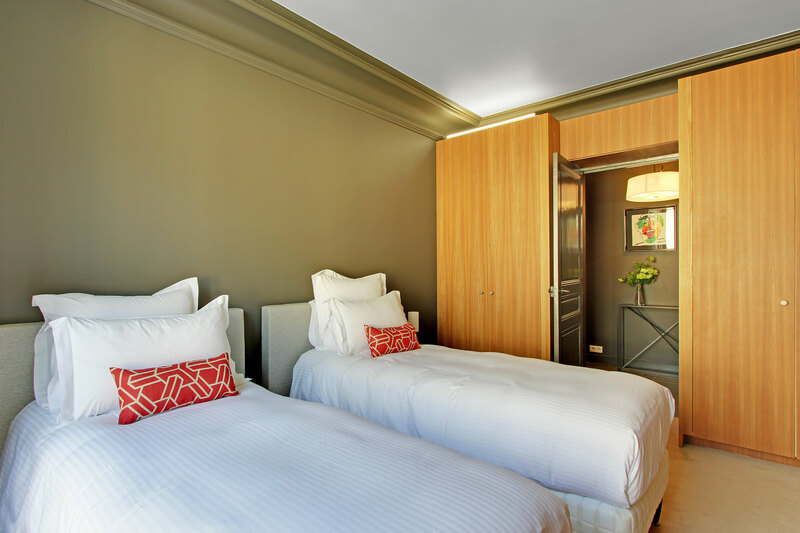 The very quiet master bedroom has a Queen size bed and French window (the beds don't convert to singles) . 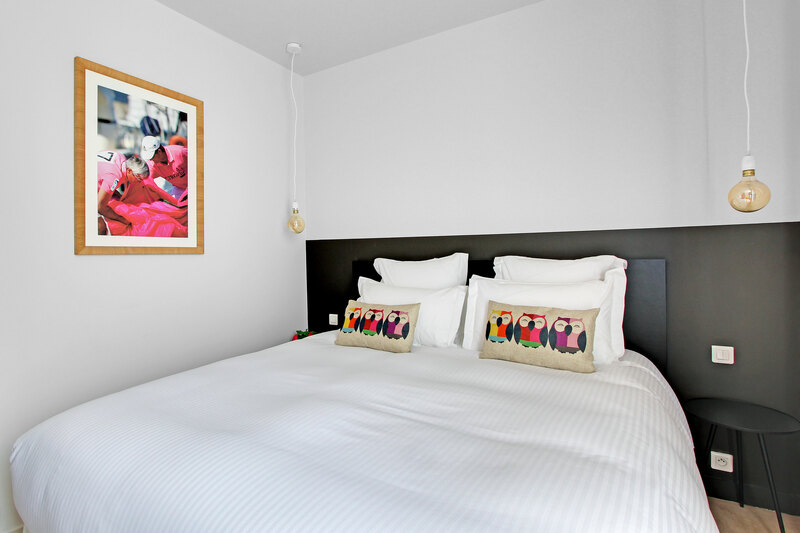 The second bedroom has a King (which can convert to 2 singles) and a large built in wardrobe. The third bedroom has either a Queen or 2 single beds. 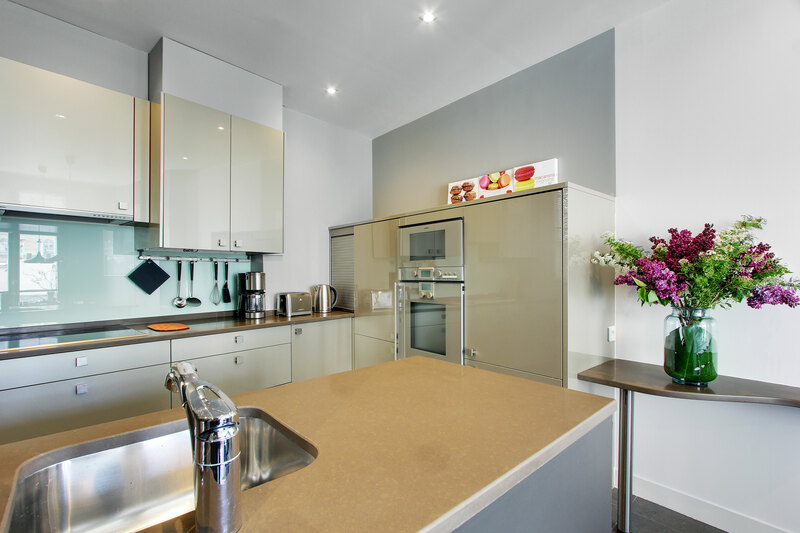 The apartment is a haven of modern and comfortable furnishings with all the appliances you could wish for yourself. Flat screen 43 inch TV in the living room, high speed internet, i-pod BW Zeppelin cradle with remote control, washing machine and separate dryer, dishwasher, air conditioning and all other amenities. The ultra modern kitchen has a wonderful dining area and a great view to the sunset. 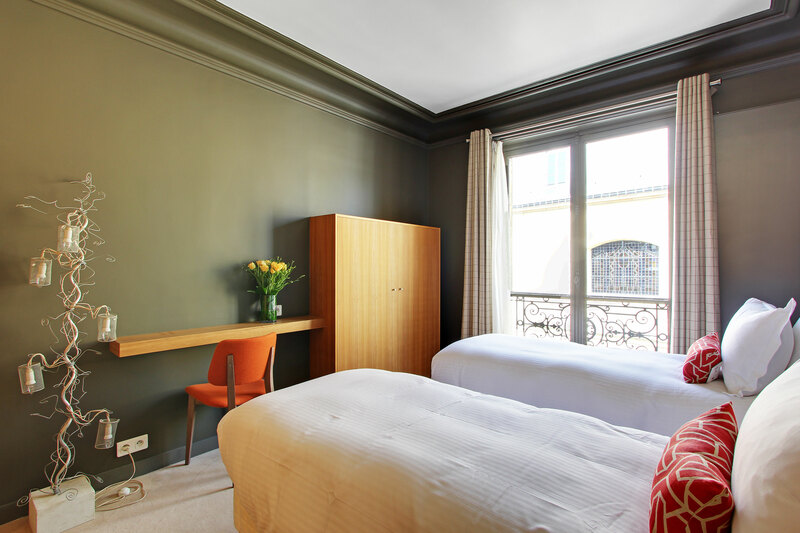 Next to the Bon Marche and the shopping area of St Germain, the area is ideal for visiting Paris and staying on the left bank. Metro Sevres Babylone is a few steps away while metro St Sulpice is also close by. 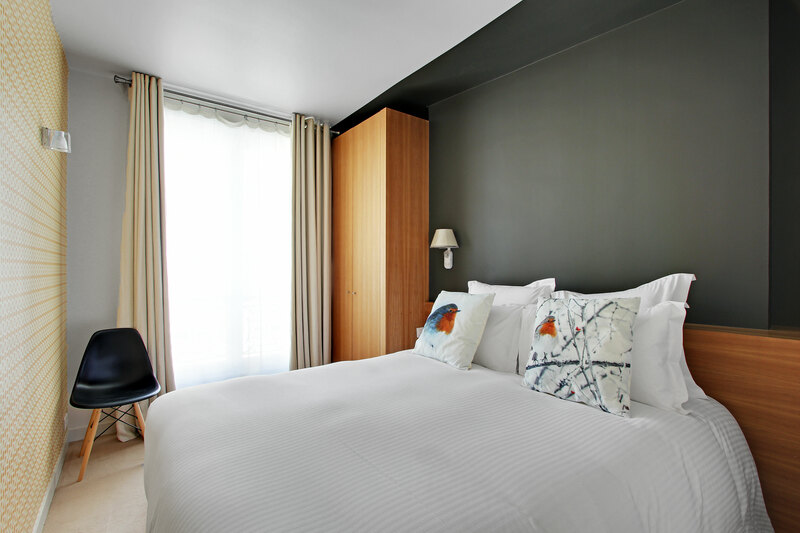 You are about a 10 minute walk to Boulevard Saint Germain, and a few minutes from the boutiques of St Germain and literally on the doorstep of the 'Bon Marche' department store with the finest gourmet food hall in Paris. There are 9 buses steps from the building taking you directly to all the sites. 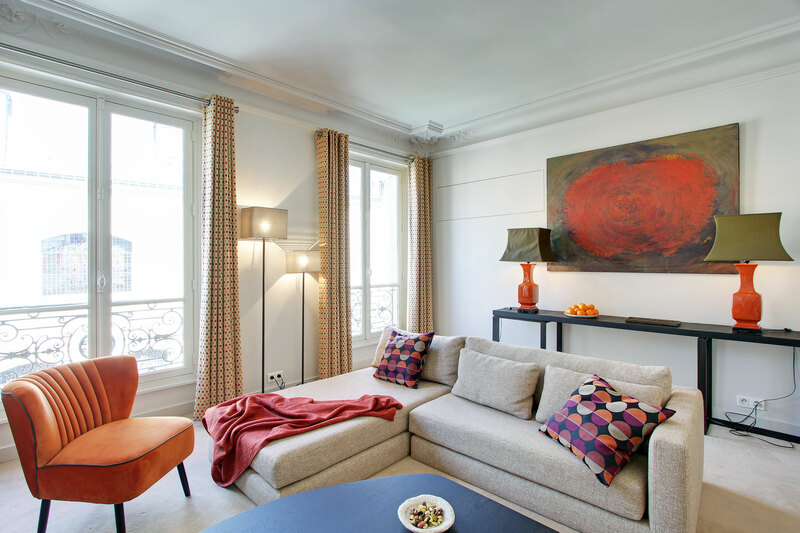 From the apartment you can walk to the Musee D'Orsay or the Louvres or hop on a bus for a few stops. 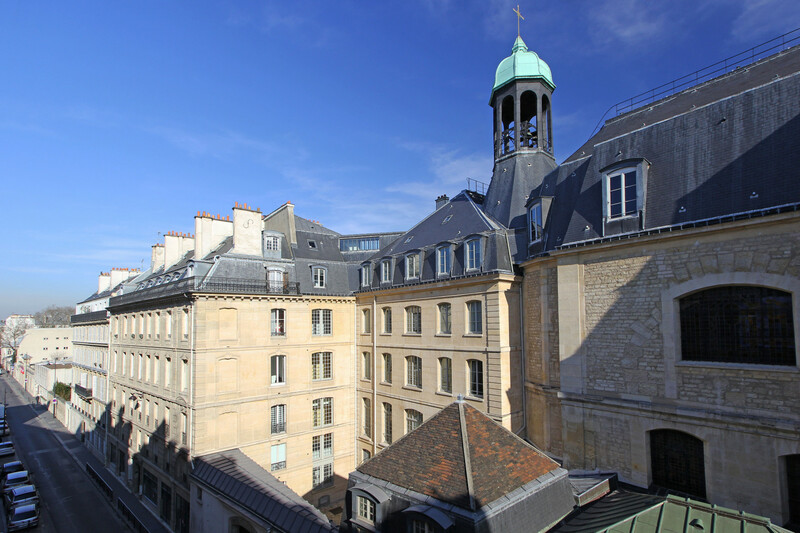 You can also step out to The Chapel of Our Lady of the Miraculous Medal a chapel on rue du Bac, revered by Catholics as the site of three apparitions of the Virgin Mary in 1830. We had a great stay Apartment isvery comfortable,spacious,has a great light.Giorgina was very helpful.Especially when last day we were locked out,She sent us a locksmith in half an hour and we saved our flight!!! Hada great stay! Apartments location is perfect too! The apartment is very pretty and very comfortable. 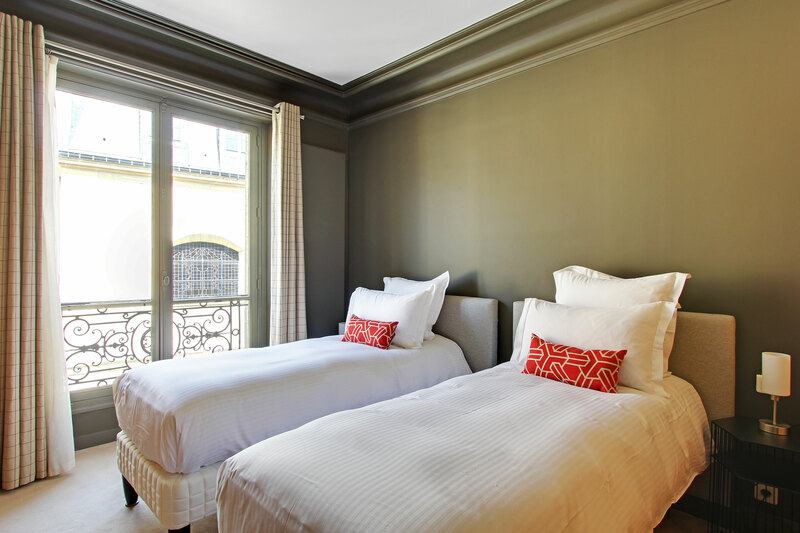 The rooms all have wonderful natural light and look out on quintessential Parisian buildings. The neighborhood is fantastic with wonderful restaurants and shops and parks with many tourist attractions are easily walkable. 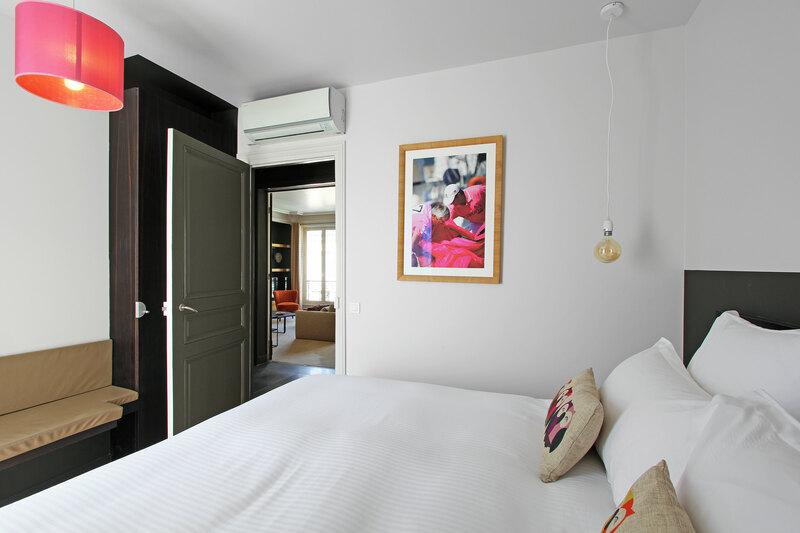 I will recommend the apartment to friends visiting Paris and would definitely stay here again if lucky enough to return. Excellent rental: great apartment, with a wonderful location. This apartment was perfect for our party (5 adults and an infant). 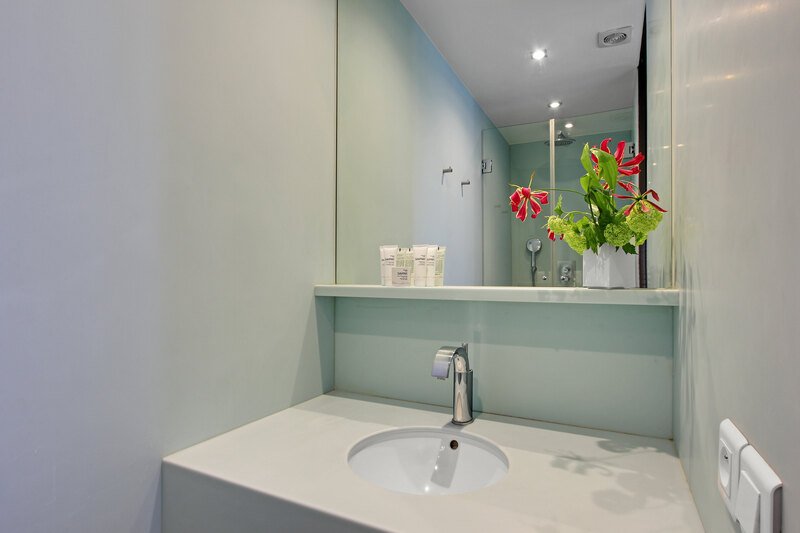 The apartment is airy and light, the beds were excellent, the living room pleasant, and the kitchen well equipped and convenient, with a good dining table. Good to have one bath plus a shower cabin. The only issue with the apartment is the single toilet - clearly insufficient for a group of six. 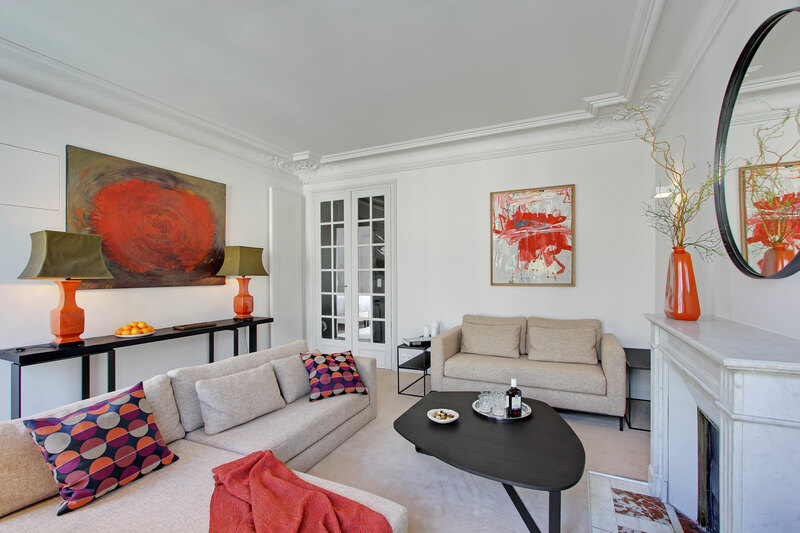 The location is also wonderful, this is a perfect spot because one can walk from the apartment to the Orsay and Rodin museums, Le Louvre, Notre Dame, the Sainte Chapelle, the whole quartier Latin, St Germain des Pres, etc etc. Having La Grande Epicerie a block away is perfect for cooking, but there are also many good restaurants nearby. 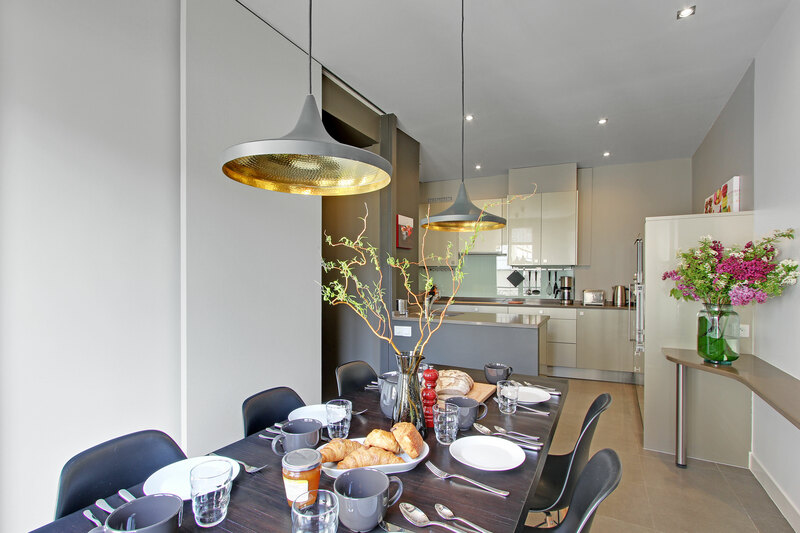 With the Lutetia being rebuilt there are few hotel choices in the 7th arrondissement, so this apartment turned out to be the best solution for a two week stay in Paris..
My family of 5 stayed in this apartment in July 2017. It was exactly as advertised and we were not disappointed. We were greeted on arrival and shown around the apartment and given tips about the neighborhood. Having A/C, plus a washer and dryer were important to us and both worked well. The 3 bedrooms meant we weren't tripping over each other too. I can't think of a single complaint, even a minor one. It's just what we needed. The neighborhood is great. It's quiet but close to everything you need. The metro stop is a 5 minute walk, grocery store a 2 minute walk. During the day the area is busy but it's not touristy. We felt like we were living in Paris, not just visiting it. This was the perfect apartment for our group of six - which included my two grandchildren, niece, my sister and her husband and myself. 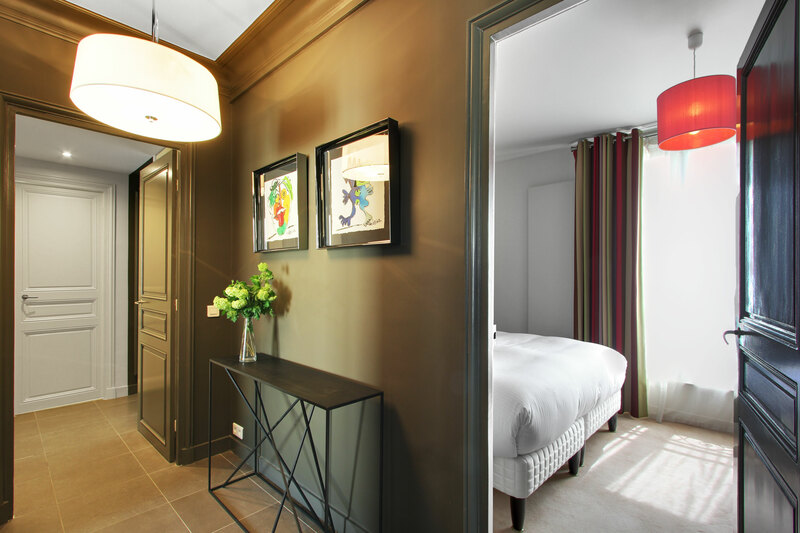 The location was ideal near the Bon Marche, restaurants and Metro. 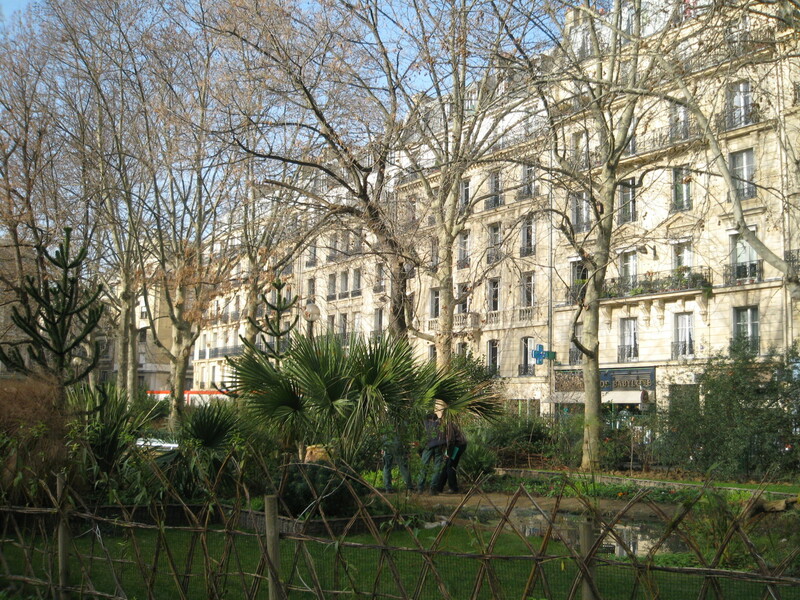 The apartment and neighborhood were lovely, and made our stay in Paris one we will never forget. This apartment is absolutely wonderful! 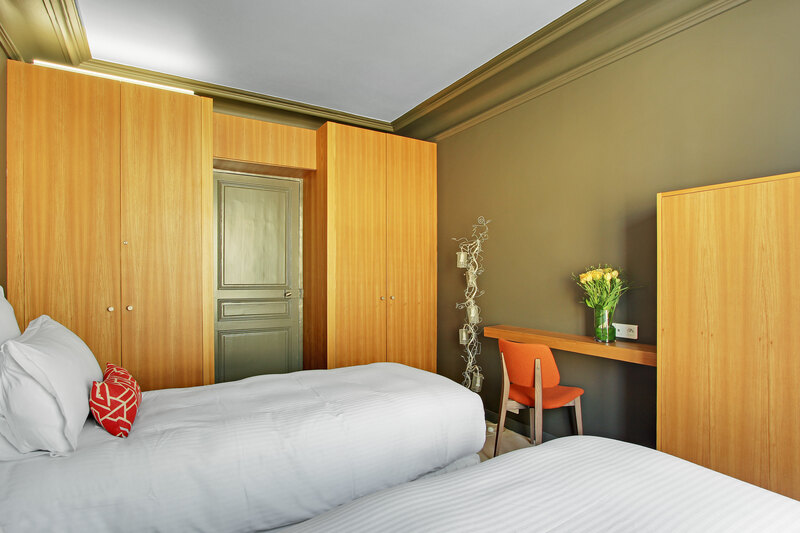 It's bright, clean, quiet and cosy - equipped with everything one needs for a stay in Paris. The neighborhood is also really nice. It's easy to get around in Paris from the apartment and the supermarket just next door was also really good! I was warmly welcomed upon my arrival and the host was available during my entire stay. I had lovely days in this apartment! The flat was in such a wonderful location in the heart of the city! The place was so easy to manage, everything worked well and the host even went out to get a coffee press so my mom could drink coffee in the morning! Excellent séjour en famille, merci à Jaymes de son accueil à l'appartement. L appartement est en tout points conforme à l'annonce et ses photos. La proximité du Bon marche, de Conran Shop et du metro (20m) rendent la vie agreable et le sejour réussi. This apartment is a perfect property for a family such as ours- 3 adults and 2 children. It would also work for 3 couples. Having a comfortable living room for hang-out time, an up-to-date kitchen so some meals can be taken at home and two bathrooms make it ideal! Everything was clean and in wTorking order. Shelly, the agent who met us on arrival, was terrific! She gave us a thorough orientation of the apartment and the area and was available later for questions and concerns-we had "operator problems" on a couple of appliances. 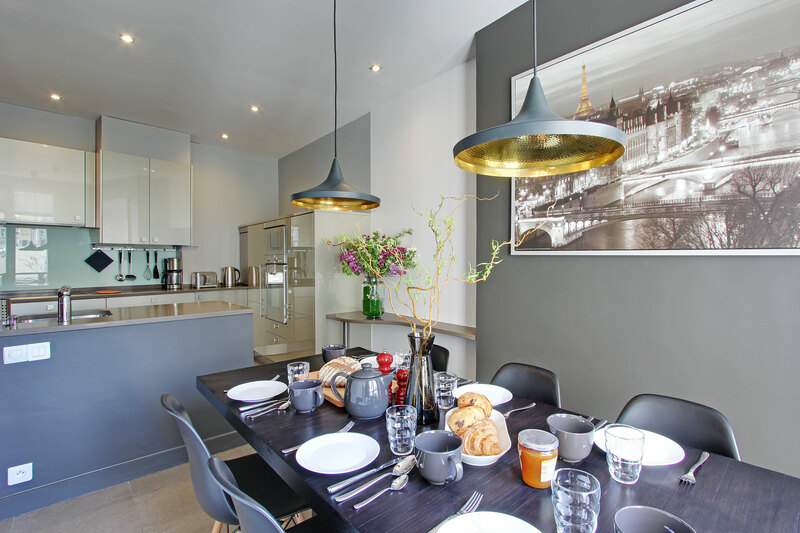 The location of the apartment (right around the corner from the famous Bon Marche) was perfect for catching the Metro or walking to such sights as the Eiffel Tower, Musee d'Orsee, Rodin Gardens, Luxembourg Gardens and many more. The surrounding neighborhood was great for shopping and enjoying cafes and restaurants. All in all, the apartment met our needs perfectly, and we would return in a heartbeat! My family of 5 stayed in this wonderful apartment over Christmas vacation, and feel we found the perfect place for us in Paris. The apartment was just as pictured. 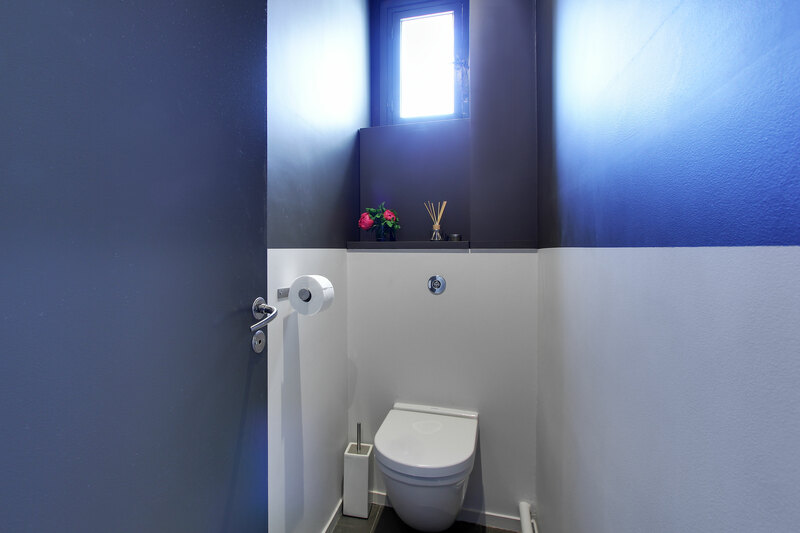 To be clear, there is only one toilet in the apartment which is in its own WC, with no sink. Took a little adjusting to that but it didn't detract from the overall experience. The bedrooms were comfortable and very quiet at night. The kitchen was large enough for us all to eat in and we made good use of the cookware and dishwasher. In the hallway there was a stackable washer and dryer which was very convenient for a week long vacation. The salon sat 6 comfortably with a large screen TV. We loved the convenience of the neighborhood. The metro stop is only 2 blocks away and the food store at the Bon Marche was fabulous. You can find anything and everything there, with many prepared food options, wine, and baked goods. 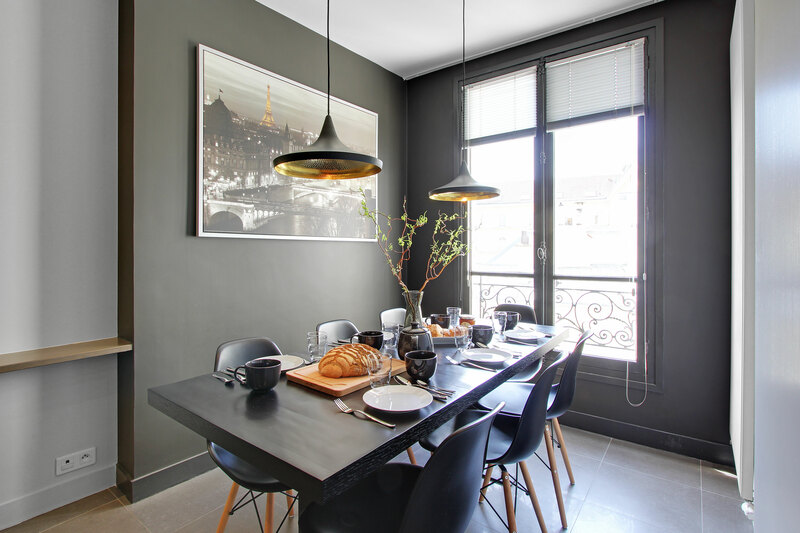 This apartment is in a great centralized location in Paris without the noise of other locations. We would definitely recommend this to friends. Recommended for: Families with Young Children, Sightseeing, Girls Getaway, Tourists without a Car, Age 55+, Romantic Getaway, Families with Teenagers. 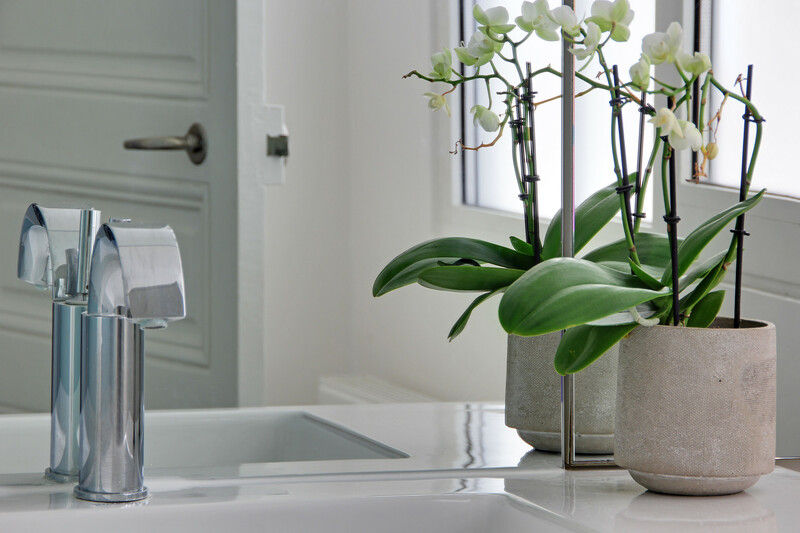 The apartment was fabulous - spacious, spotless, well appointed. The location was perfect - right next to Le Bon Marche and lots of shopping/eating, but on a quiet street. The agent was very easy to work with. We organised for cribs beforehand and they were there, and set up, when we arrived. We had a problem with the heat and the agent came to the apartment immediately to fix it. The service was faultless. 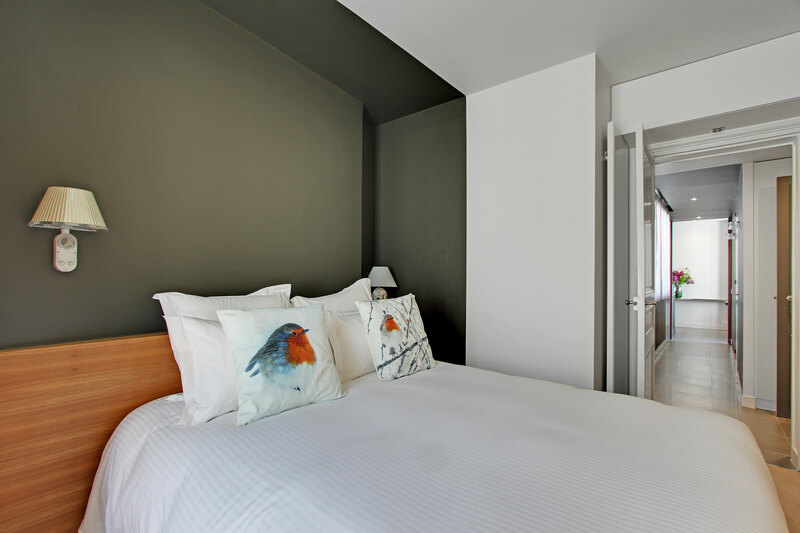 This is by far the best apartment rental experience we have had in Paris and we would definitely stay here again, and recommend it to others. Recommended for: Families with Young Children, Girls Getaway, Tourists without a Car, Age 55+, Families with Teenagers. 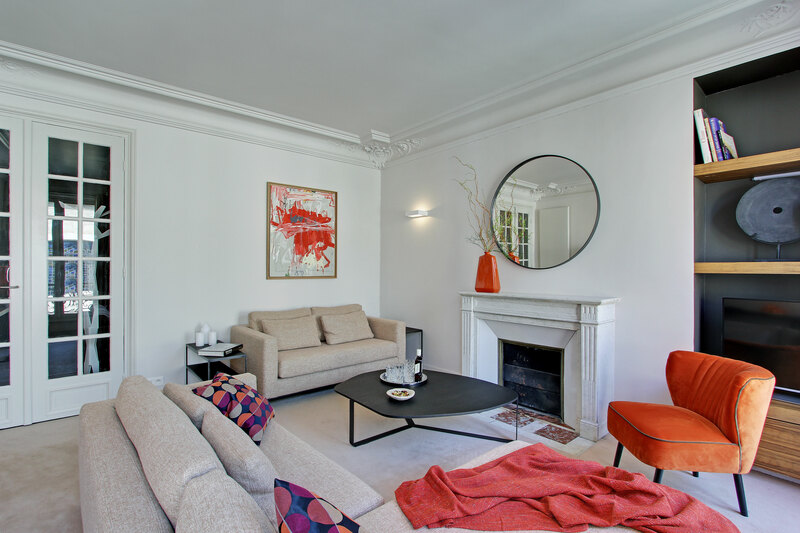 US family said... Jul 13, 2015 As promised 17 rue de Babylone, Paris, Ile de France, 75007, France Date of Stay Jun 27, 2015 Helpful votes: 3/0 The apartment was very much as pictured and described. The location was great for access to food, the Metro and attractions. The unit was spotless and had everything we needed. Air conditioners in the bedrooms and living room were critical as we were there during a heat wave. As others have pointed out - elevator can fit two people at most - really just for when you have luggage or groceries. Would definitely plan to stay again on our next trip. Recommended for: Families with Young Children, Sightseeing, Families with Teenagers. Our stay at this apartment was excellent. The apartment was everything it was advertised to be. The location was perfect for getting to many of the sights in Paris. 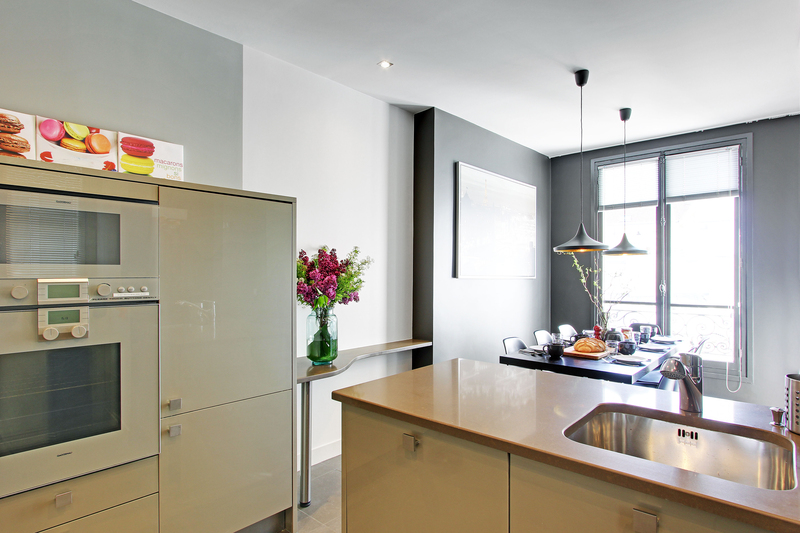 The agent who greeted us was very friendly and informative as to the workings of the building and apartment. We had to change our arrival plans at the last minute due to the Air France strike and the agent was excellent in his communication with us and making the necessary changes. thanks for a great Paris experience. It was our 30th wedding anniversary. so we wants to celebrate with our family. This included 3 couples My wife and daughter and son and significant others. The 3 bedrooms were so spacious. The Kitchen and eating area was very modern equipped we enjoyed many cooked meals. We were fortunate to watched the FIFA Soccer in the spacious living room. 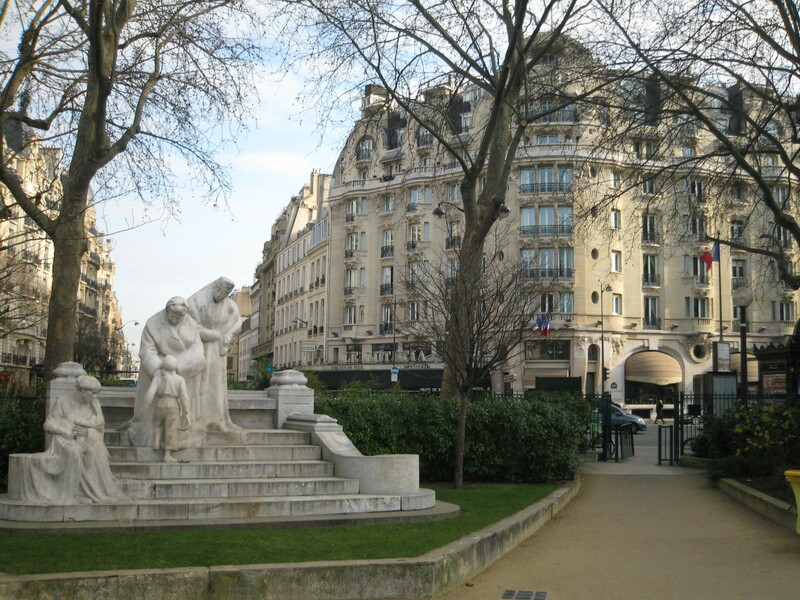 The location was so close to the grocery stores and the Metro so we could venture out to the beautiful city of Paris. This was a wonderful place to stay for us and we all would want to return one day. We talk about this as the vacation of a lifetime. Thank you. We had a very enjoyable week at Babylone3 – the kitchen was particularly well set up, the furnishings were comfortable, and the location was terrific. 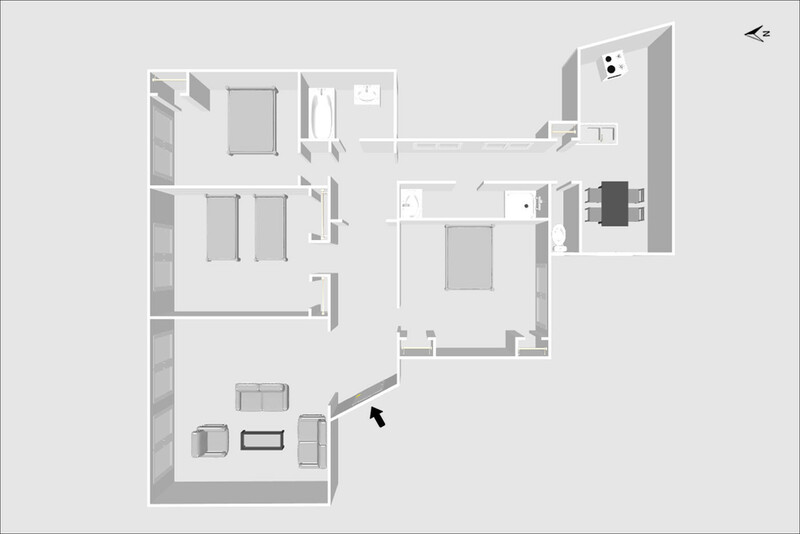 The three bedrooms seemed all about the same size, and the apartment accommodated 2 couples and 2 kids (5 and 8) easily. Street noise was not bad. The bathroom setup is a bit funky, with 1 room containing a bath/sink (the bathtub did not seem to work, but there was a shower attachment), 1 room with a shower/sink, and a third room containing nothing but a toilet, so to wash up after using the toilet it was necessary to go to a different bathroom. Overall, it was a great place for our group. Apartment was exactly what it appeared! Perfect location which felt like home. Easy to walk everywhere. Well appointed and comfortable in all regards. Perfect spot for a family or 3 couples. Just beware that despite having two bathrooms, there was only one toilet for everyone. Everyone at Paris Rentals was responsive and spoke great English. Only complaint I could come up with was that there was some peeling paint in the bathrooms. Can't wait to return for longer. We were very pleased with the accommodations. 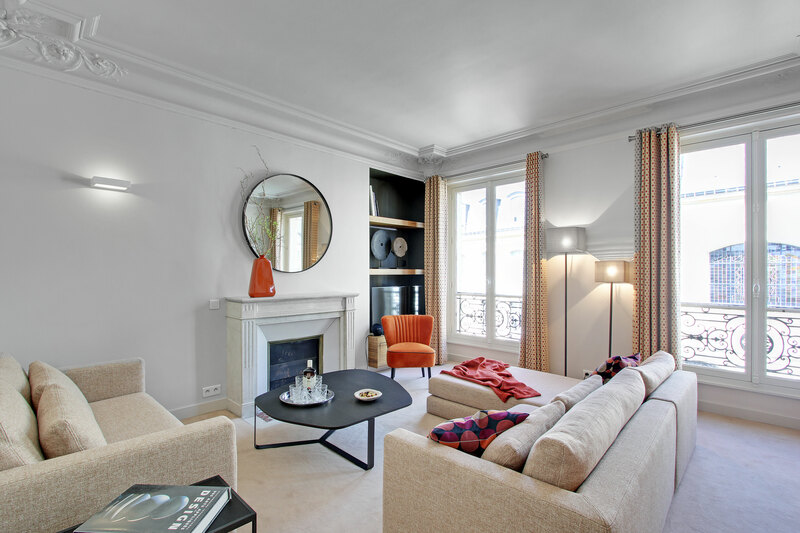 We would recommend this apartment to anyone wanting a great location on the L. bank of Paris. The rental staff were great and made certain we were taken care of. We look forward to going back to this location. 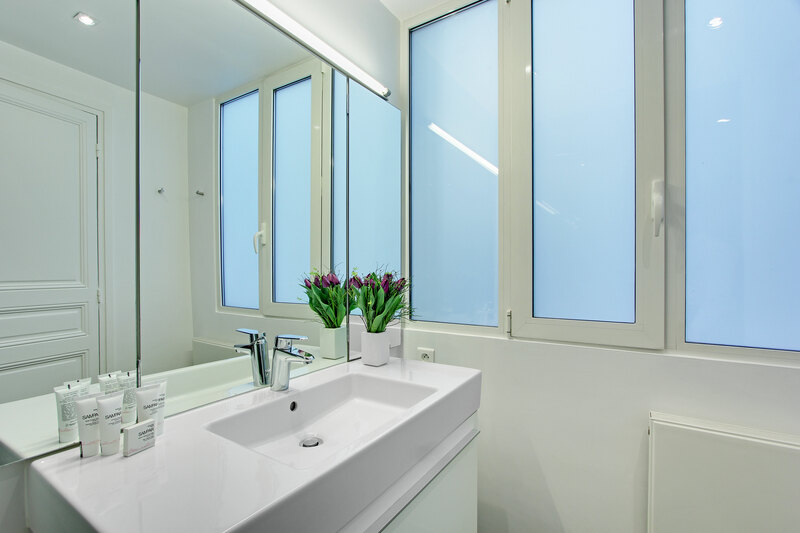 We have rented several apartments in Paris in the past and this was the best experience we have had. 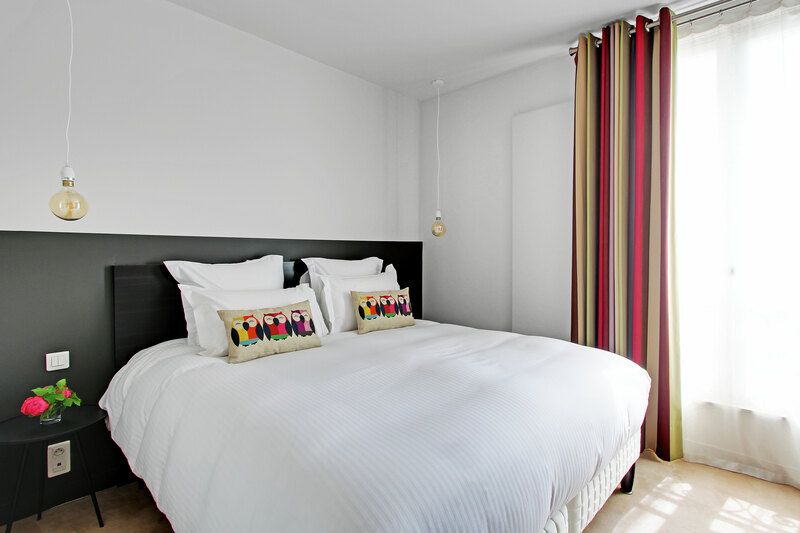 The apartment is lovely-well equipped, great location and beautifully presented. The booking, payment and arrival service was terrific. Mats even recommended a show,which we absolutely loved,and would not have known about if not for his friendly arrival information. We are a family of 6 with adult children and this apartment was perfect. La grande epicerie just around the corner and a well set up kitchen meant we had a lot of fun dining in as well as eating in the gorgeous Parisian restaurants. We would definitely book this again-we loved it! A group of 5 of us stayed in this great apartment for a week in October. This is our second time staying here. The apartment has some wonderful amenities - a great kitchen, comfy beds, a washer/dryer and a lift to make it easy to bring up groceries. The location is great - the Bon Marche Epicerie is right around the corner and a great place for picking up croissants and other gourmet food items. Close to wonderful shopping in St Germain and on quaint Rue de Bac. Only a block from the Sevres Babylone metro station. Shelley was very informative and helpful when she greeted us on our arrival and the car service that was recommended was top notch. We would definitely stay here again when we return to Paris.